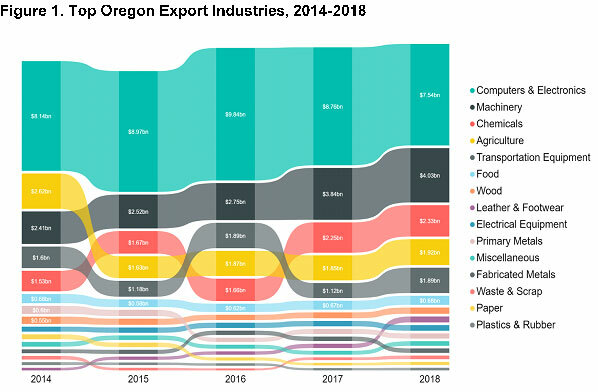 New data from the U.S. Department of Commerce reveals that despite an uncertain U.S. trade environment, Oregon exports continue to grow. In 2018, the state exported $22.3 billion in goods to countries around the world—a 1.8 percent increase from 2017. “Food and agricultural exports remain critical in supporting comminutes across the state. We will continue to prioritize these vital trade relationships and pursue new international markets; our industry and economy depend on it. With 80 percent of Oregon’s food and agriculture production leaving the state and 40 percent leaving the country agriculture’s $98 billion-dollar economic impact is felt in all corners of the state. We are excited to continue our work in building strong trade relationships that allow Oregon’s in demand, high-quality products to show up in markets across Asia, North America, and everywhere in between,” said Alexis Taylor, director of the Oregon Department of Agriculture.